Can Diet Coke Cause Fluid Retention? If you're feeling bloated, especially around your feet, ankles, face or fingers, you might be suffering from fluid retention. Fluid retention, also sometimes called water retention or edema, occurs when fluids build up in your body, leading you to feel puffy. While Diet Coke contains caffeine and sodium, both of which can cause your body to hold onto fluid, it's unlikely that drinking it will cause severe fluid retention. 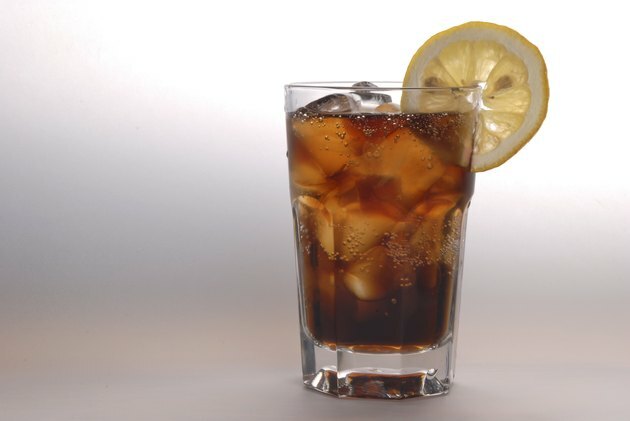 If you do experience edema from drinking Diet Coke, you can treat the condition yourself. Fluid retention occurs when your body's lymphatic system fails to drain enough fluid from your tissues into your bloodstream. While fluid retention can be localized -- only certain parts of the body are affected -- often it occurs throughout your body, though signs of swelling may be more evident in your extremities. Fluid retention can be a result of a number of factors, including the consumption of caffeine and sodium, which are both present in Diet Coke. Diet Coke contains caffeine, which is both man-made and naturally occurring. It is a diuretic, which helps your body get rid of fluids. Caffeine signals your body to rid itself of fluid, whether it needs to or not; as a defense, your body then holds onto fluids to prevent dehydration. A 12-ounce can of Diet Coke has 42 milligrams of caffeine per serving, while caffeine-free Diet Coke has none. MedlinePlus recommends no more than 200 to 300 milligrams of caffeine per day. A diet high in sodium can cause fluid retention and increase your risk of developing heart disease. Most Americans consume too much sodium in their diets, often as a result of consuming processed foods, such as Diet Coke. A 12-ounce can of Diet Coke contains 10 milligrams of sodium. The amount is even higher, 40 to 70 milligrams per serving, for flavored Diet Coke. The relatively high amount of sodium, considering the small serving size, might come as a surprise given how sweet Diet Coke tastes. The recommended upper intake of sodium is 2,300 milligrams per day, but it drops to 1,500 milligrams if there is a history of heart disease, you are over the age of 50 or you are African-American. The self treatment of fluid retention might sound counterintuitive: Consume more fluids. Drinking more fluids, especially low-sodium, caffeine-free choices such as fruit juices and water, will help your body's tissues release fluid, as it no longer believes it is in danger of dehydration. While there is no set recommendation, many health professionals suggest consuming a minimum of eight 8-ounce glasses of fluid per day. More is recommended if you engage in strenuous activity or experience high temperatures. Similarly, more may be needed if you consume a lot of sodium or caffeine. Coca-Cola: How Much Caffeine Is in Diet Coke, Coca-Cola and Coke Zero?